The best part of my job is randomly stumbling across a game no one knows about, by a developer no one has heard of, and have it absolutely blow my mind. It doesn’t happen often, but when it does, it results in drained batteries and dropping everything to get something on the site about it while I wait for my iPhone to charge only to return to the fray. 10000000 ($2.99) popped up on the Hot New Games list on the TouchArcade App (Free) this afternoon (True story!) and, as usual, I downloaded it to give it a spin. I lost most of my afternoon and the better part of this evening to 10000000, and I’d do it all again (and probably will tomorrow). 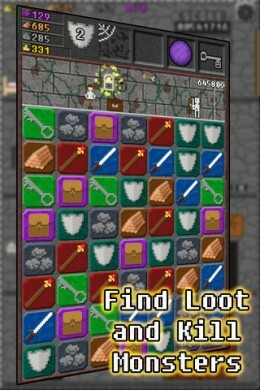 Developed by EightyEight Games, 10000000 feels like a spiritual successor to Dungeon Raid, another favorite of mine. Its core mechanic hinges around a simple matching game. 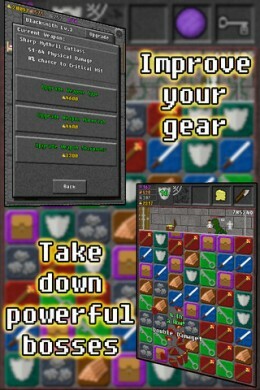 Where Dungeon Raid had you drawing lines to match tiles, 10000000 instead has you swiping to move entire rows of tiles either up and down or across. This mechanic has been done countless times before on the App Store, most notably in PopCap’s Chuzzle ($2.99). Also like Dungeon Raid, this matching element is merely the engine that drives a much, much deeper game. In a nutshell, the top side scroller looking area of the screen is a cleverly disguised timer and health bar. Your character runs through a dungeon, and all of his actions are controlled by the blocks you match. Need to unlock a door or a chest? Match some keys. A monster blocking your path? Physical attacks are executed by matching swords while magical attacks fire off by matching staves. Standing still by not matching causes the timer to tick down, pushing your character to the left, and getting hit by monsters also pushes you to the left. The damage aspect can be mitigated by matching shields, which are absorbed instead of pushing your character. Fall off the side of the screen and it’s game over. To supplement these mechanics are a set of shockingly deep loot, item, upgrade, and experience systems. 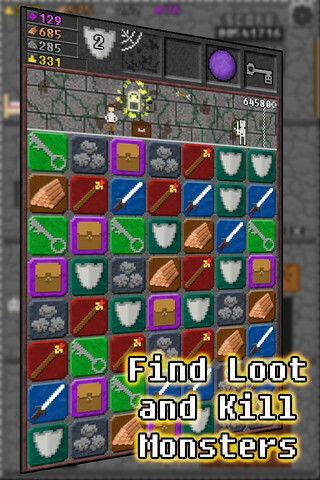 Monsters can drop loot, and you can also get loot by matching backpack tiles or unlocking chests. Loot can either be gold to buy upgrades or actual usable items. A few items you’ll come across are a red orb that’ll damage whatever monster is in front of you, a key to instantly unlock a chest or doorway blocking your path, scrolls to spawn more tiles of a certain type on the board, and much more. The other two types of tiles are wood and stone. These are used to upgrade your castle, and by collecting these resources you’ll unlock additional rooms your character can enter to do things like buy persistent bonuses, a better sword, stronger magic, and more. 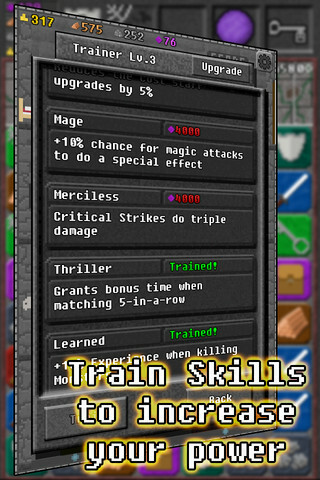 Swords and spells are bought with gold you earn, while persistent abilities (such as matching wood or stone adding time to the timer) are purchased with experience points. It’s seriously just silly how much is going behind the scenes of such a simple looking matching game. As you rank up, you face tougher opponents, but are rewarded with higher point multipliers. Oh, and there’s even a Jetpack Joyride (Free) style objective system where there will be three goals each time you play, completing them awards bonus gold. Also, even though your dungeon run will inevitably end in death, you keep all of your upgrades and even unused items for your next run. This invokes a fantastic sense of progression, compared to Dungeon Raid, where a death means starting over. The strategy that goes in to playing this game well is downright incredible. The balancing act you need to execute is crazy, as you need to keep the game board in a constant state of readiness to fight monsters, unlock a door, and/or restore your shields. Meanwhile, backpack, stone, and wood tiles are randomly interspersed with your new tiles. These are useful, but not in the heat of battle. So, when your character is running forward you need to focus on matching backpacks, stone, and wood, all while making sure you’re not accidentally clearing keys, shields, swords, and staves. If you focus too much on resource collection, chances are you’ll be beaten to death by a monster or time will run out while you’re trying to unlock a door. Similarly, if you focus on the tiles vital to dungeon crawling, you can wind up in a situation where you’ve got no way to attack because the game board is filled with resource tiles. The only down side for us Dungeon Raid veterans, if you’d even call it that, is that character customization seems to be lacking. So far, your upgrade path is fairly linear in you basically just buy the bonuses and upgrades you can afford. This could change deeper into the game, although what I’ve seen so far doesn’t make me think it has anywhere near the customization of Dungeon Raid. Also, oddly enough, there’s no pause functionality. If you need to pause while you’re playing, the only thing you can really do is double tap the home button to bring up the multitasking bar. A weird omission, sure, but most games are short enough that it doesn’t seem like it’d be much of an issue. I can’t wait to find out what happens when I hit 10,000,000 points in 10000000. After each game your point total goes into a running tally labeled “FREEDOM." [Edit: your point score is your high score ever achieved in one run, not a total.] There’s a part of me that hopes its something awesome, and, another part of me that hopes it’s just like Desert Bus ($0.99) and when you hit your goal your actual score merely increments by one. Either way, it’s going to take a lot of playing to find out. The chiptune soundtrack in 10000000 pairs perfectly with the retro art style, and the game is even universal. It seems to play equally well on both the iPhone and iPad, although iCloud save game synchronization is sadly lacking. Regardless, I still can’t believe just how good this game is. Its non-descript name and even vaguer icon left me with no clue as to what to expect, but I’ve found a new love on the App Store. 10000000 scratches the itch of a quick puzzle game that works fantastic on touch screens all while having a much larger and much deeper purpose to every game session. This is a game you need. In fact, download it, tell two friends to download it, and tell them to do the same. You won’t be disappointed.